Gerrit is a code review tool built on top of git. It also manage permissions for repository access. Please note that this feature depends on LDAP authentication. The integration is meant to be as lightweight as possible so end users can use all power of Gerrit. Tuleap simplifies creation and management of the repositories, users and user groups. It doesn’t restrain gerrit features at all. You can connect several Gerrit instances to one Tuleap server. One Gerrit instance can be connect to several Tuleap servers. A Gerrit server connected to Tuleap can also be used without Tuleap in full autonomy for projects, groups and user management. 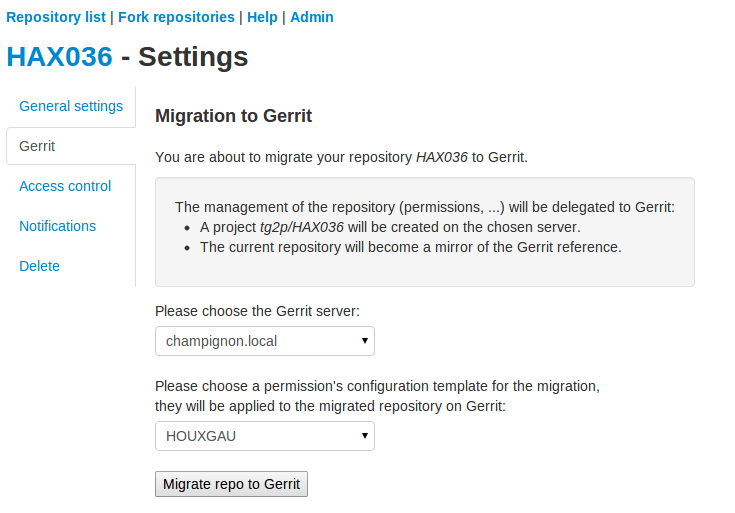 The gerrit migration panel can be found in git repository settings. You need to be a project administrator to have access to it. As a project administrator, you can migrate a git repository from Tuleap to Gerrit. After replication, the sources will be replicated on the Gerrit server with a set of default permissions based on access rights at the time of migration. On Tuleap side, as soon as the git repository is migrated, the repository is turned read-only (the reference is now on Gerrit). User can still browse the repository through the web UI, clone it or fork it but all write operations are blocked (even for admins). However, all permanent changes (branches & tags) made on the corresponding Gerrit project are replicated to Tuleap. When developers make commits on Gerrit, there is a delay of a few seconds to see this commit replicated. 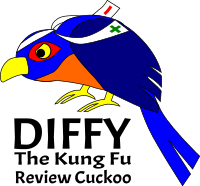 Please note however that review related things (patchsets, review & co) are not replicated. Technically speaking, only refs/heads/* and refs/tags/* are. As a side effect of a project migration, all user groups are replicated to Gerrit too. See corresponding section below. In Gerrit terminology, a git repository is called “project”. To reduce confusion, we will talk about Gerrit project. In following sections, we will take the example of an imaginary Tuleap project “mozilla” with two git repositories “thunderbird” and “firefox”. The Gerrit project “mozilla/firefox” contains sources and is where developer will push for review. 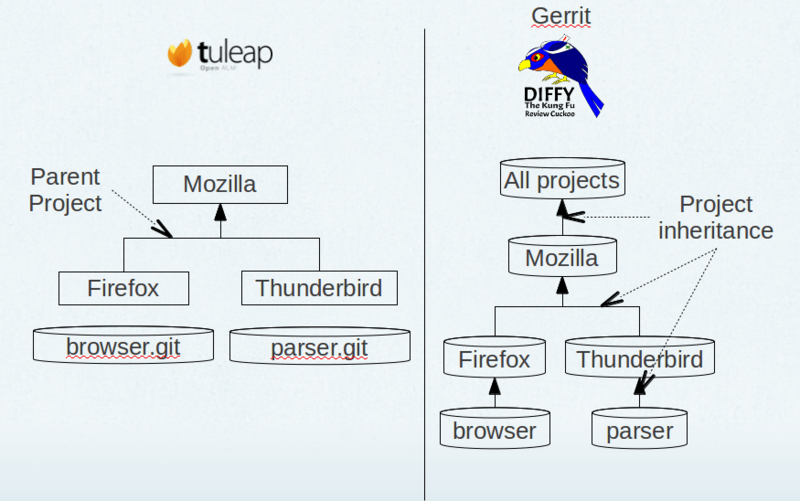 The Gerrit project “mozilla” is a permission only project (no sources can be pushed into) and is meant to group all git repositories that come from the same Tuleap project. It’s convenient to define common permissions for several repositories. Tuleap comes with a default set of permissions for each Gerrit project. Those permissions are set at project migration only. No subsequent modifications of permissions are done by Tuleap. As project administrator, you can redefine the whole Gerrit permission scheme as you wish. If you need to create new user groups to tailor your workflow, see “User groups management” section below. You can also define templates to be applied to refs/meta/config on Gerrit and which defines the access rights. To apply a template on migration, you simply have to select it within the proposed selectbox as you can see on the figure above. These templates can be defined using the admin panel of Git. They must be valid ones in order to be correctly applied during the migration process. You can use the variable %projectname% which will be replaced by the project’s name during migration. For further informations regarding these templates, please refer to the Gerrit’s documentation. This feature aims to address complex setups where a lot of Tuleap projects and git repositories are involved. The main objective is to simplify the definition of common rules and leverage on gerrit permission inheritance to apply them. User group management helps to keep consistent your teams between Tuleap and Gerrit. When someone join or leave your team, just add or remove it in Tuleap project and it’s automatically propagated to Gerrit. Warning: It’s not safe to update those user groups directly in gerrit. If you add or remove someone manually Tuleap might undo this change without prior notice. If you ever need to have a user group with custom membership you should create a dedicated group in gerrit. The two first user groups are created by default out of “Members” and “Admins” list. When I create a binding between two user groups in Tuleap, the two groups are linked in gerrit (even if the user group, source of the binding doesn’t exist on Gerrit yet). When I remove a binding between two user groups in Tuleap, the source group is no longer included in the target group and all members of the source group are added into the target group. To help people to start working with Gerrit, user ssh keys stored in Tuleap can be imported on Gerrit server. As soon as a user belongs to a Tuleap project with at least one git repository migrated to Gerrit, all modifications done to user ssh keyring are propagated to the corresponding user account on the server. In other words, when user add an ssh key on Tuleap, the ssh key is added on Gerrit server and vice et versa. This key management doesn’t override Gerrit ssh keys, it will not delete keys Tuleap doesn’t manage. Note: the first connexion between Tuleap user account and Gerrit user account is not done automatically. Each user have to go on Tuleap “Account Maintenance” page and click “Push SSH keys” button. All future operations are automated. Once a repository is migrated, you can decide to revert this action and “disconnect” gerrit and tuleap. In all cases, it means that Tuleap repository will be writable directly again (you can change permissions, you can push, etc). Those actions are available on the “Gerrit” pane in git repository settings, there is a small delay between disconnect request and application. 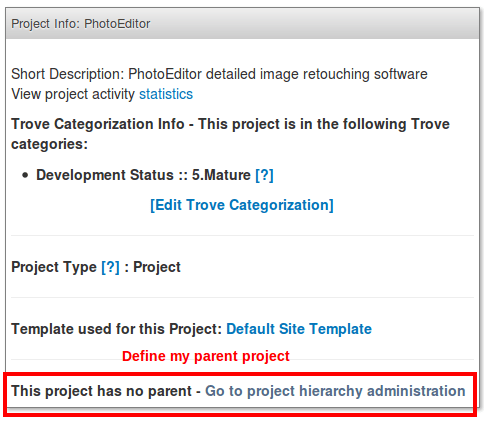 Delete option is only possible if site admin configured “deleteproject” plugin on gerrit side (see Setup). If delete is possible, it will be proposed as a checkbox next to disconnect button. Deletion will delete the corresponding Gerrit project (and only this project). All data (git commits, reviews, changeset, etc) will be permanently erased. After a deletion, if you ever want to re-migrate a repository, it’s possible (it’s not the case with Disconnect). If you choose not to delete, the Gerrit project AND the Tuleap repository will be writable in the same time. then you delete the gerrit project and start again. With a simple disconnect, you cannot re-migrate the git repository. You will be asked to delete it beforehand. 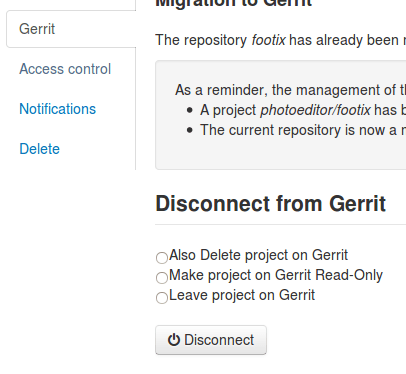 Before being able to re-migration, I should delete the Gerrit project. A variation of disconnect is to “Disconnect and keep read-only”. As expected, the corresponding Gerrit project will be turned in read only mode. It’s useful for archiving purpose. This section is for Tuleap site admin and explain how to setup Tuleap/Gerrit integration. If you are developer, you don’t have to read this section. LDAP plugin must be installed, configured and active. Both Tuleap and Gerrit rely on LDAP for common user management. To connect as gerrit-adm, you first need to configure gerrit to authenticate with LDAP. Restart or stop/start your gerrit as explained in the gerrit quick_install documentation. 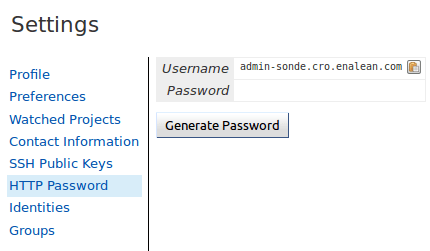 Start the gerrit instance, go to the web ui and create the administrator account (the first account registered is the administrator) for gerrit-adm. Through the gerrit web ui, go to the settings and upload your very own local ssh key. This gives you ultimate rights over gerrit.instance.com as a super administrator. It’s bad practice to use this account for anything but major changes so we will add a general administrator account for taking care of the day to day administration of gerrit.instance.com. 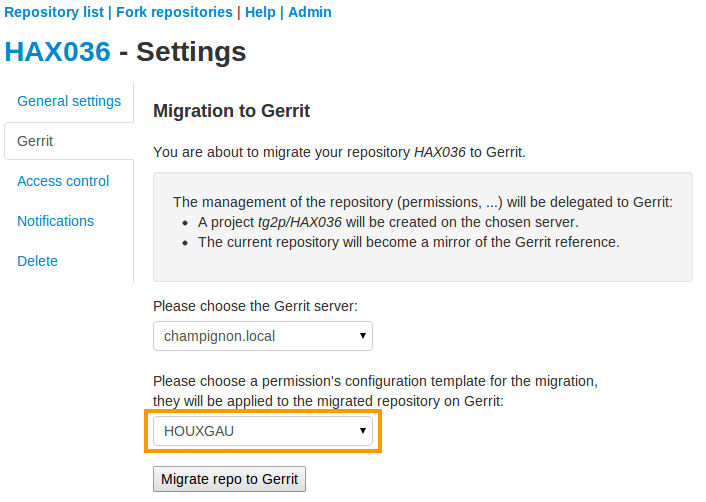 To configure gerrit replication we need to use the gerrit replication plugin. This plugin comes as part of the gerrit package that you have downloaded. There are two steps to using this package. Let’s assume you have already followed the steps in the link above and have a folder called _gerrit_testsite_ where all the gerrit files are located. Now go back to the gerrit package you downloaded. You inflate the jar of the replication plugin into gerrit_testsite/plugins/. You need to generate an http password through the Gerrit web interface for Gerrit admin user admin-my.tuleap.server.net. To do this, log-in into your Gerrit instance as admin-my.tuleap.server.net, go to settings menu, and choose http password. Then click on generate. On Gerrit server, log back in as gerrit-adm and give admin-my.tuleap.server.net Administrator rights: In the interface, go to Groups > List > Administrators then add admin-my.tuleap.server.net in the input box and click on Add. On Gerrit server, as Administrator, go to Projects > List > All-projects > Access. Add Forge Committer Identity and Forge Author Identity permissions for the group Administrators (this will allow Tuleap to push commits it’s not the direct author of). By default, the admin email of your Tuleap instance is hard coded to something like codendiadm@my.tuleap.server.net which by default has no mailbox. This value is set in /etc/codendi/conf/local.inc under the vatiable $sys_email_admin. The current value of the Tuleap admin email can be found by logging-in to Tuleap as admin and going to the My Account page. If the value of email does not correspond to a valid mailbox then this step cannot be done via the web UI. From now on, we will refer to the aforementioned email as admin_email. In essence, what this step achieves is to have matching emails for the admin-my.tuleap.server.net account on Gerrit and the Tuleap admin user that pushes content to gerrit. Note: there may be permission issues when doing this with later versions of Gerrit. You will need to either give Administrators greater rights or fall-back to the other method (above). If it doesn’t exist then you need to create it via ssh-keygen as above. Authentication type Either Digest (default) or basic. This depends of the configuration of your gerrit server. If you didn’t set [Auth] gitBasicAuth = true in gerrit config let “Digest” as default. The form in Git plugin administration to add gerrit server. From Tuleap 6.5 onwards, it will be possible to delete a Gerrit project after it has been disconnected from Tuleap. For this option to be present in Tuleap, the Gerrit server needs to have an additional plugin. For later version, you have to build the plugin yourself. Starting Tuleap 9.5, each gerrit server can be restricted by project. This can be handy if you want to segregate gerrit server usage. This means that only the selected projects will be able to migrate a Git repository into this Gerrit server. 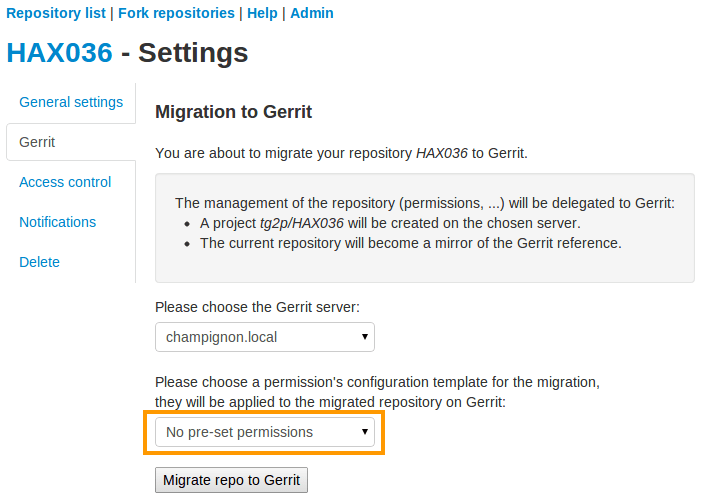 The projects that have at least one Git repository migrated into this Gerrit server will be automatically set when restricting a Gerrit server. 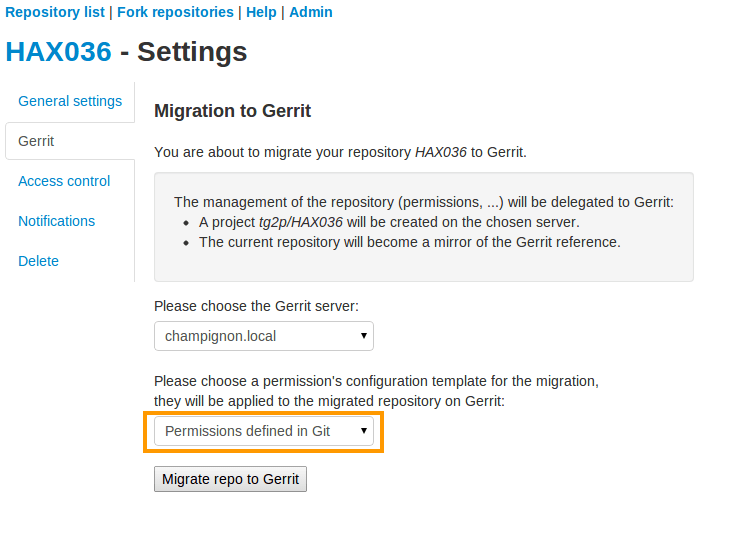 A project that have at least one Git repository migrated into this Gerrit cannot be removed from the restriction. 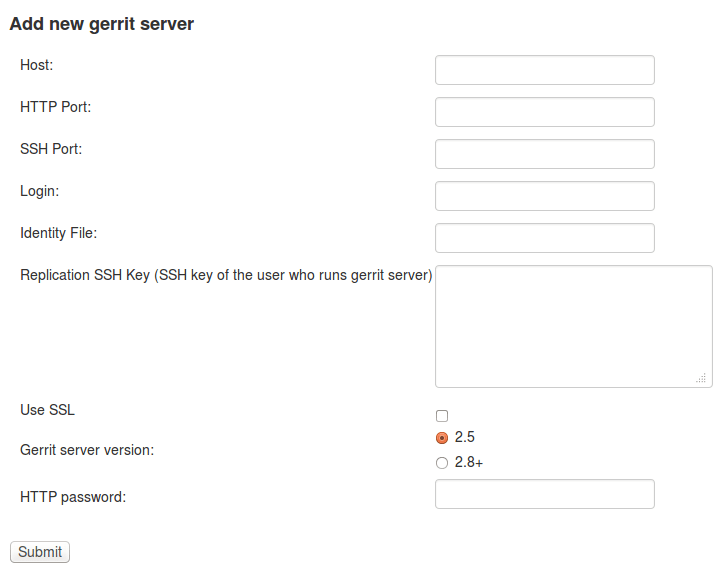 The Gerrit server restriction is also taken into account in the REST API.